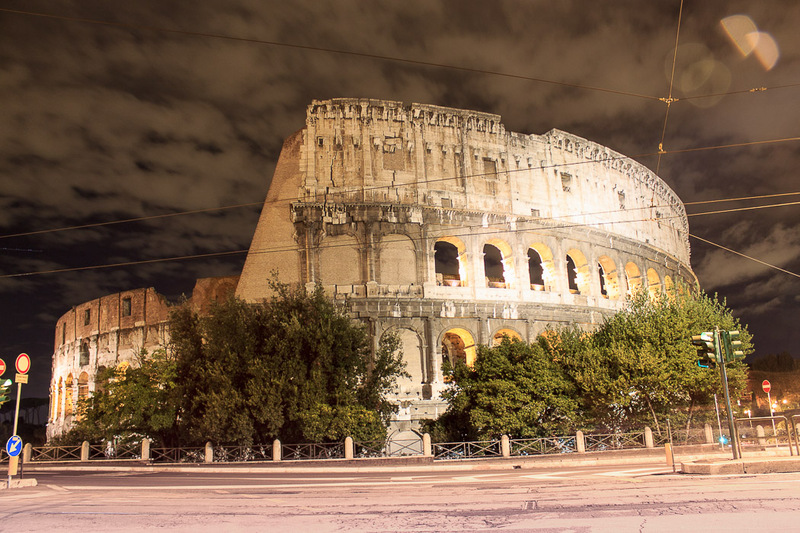 The Colosseum is the number-one sight to see in Rome. 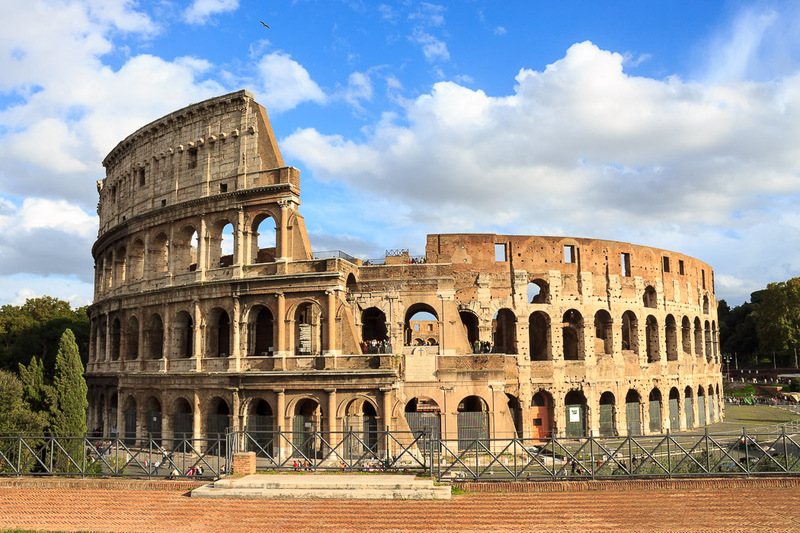 It costs €15.50 for a ticket see the Colosseum, the Roman Forum and the Palatine Hill. The ticket allows you one admission into each of these venues over a two-day period. The lines to purchase the ticket at the Colosseum are quite long. 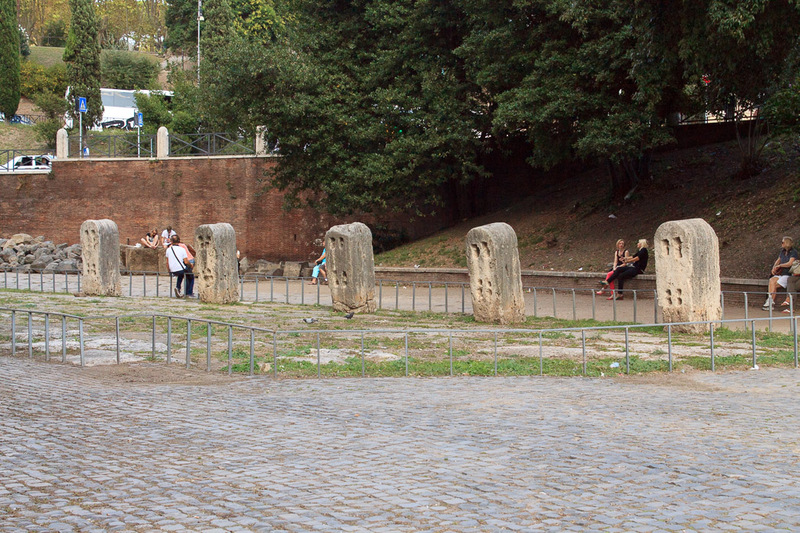 The Roman Forum entrance (on Via dei Fori Imperiali) is medium length, the Palatine Hill entrance (on Via di San Gregoriano) is usually short. So you can purchase your ticket at the Palatine Hill entrance, then go to the Colosseum and get in the entry line, skipping the much longer ticket purchase line. Another way you can avoid the line and perhaps save some money is with a Roma Pass. A third way you can avoid the line is to book a tourguide in advance. 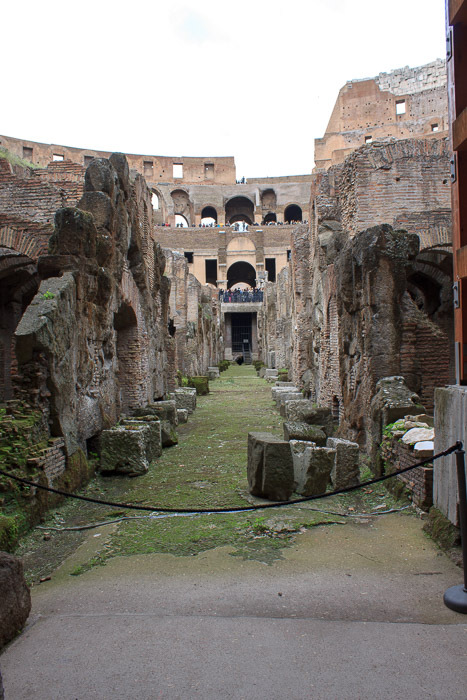 In fact, this is required if you want to see the hypogeum and the third level of the Colosseum. We'll get to that a few paragraphs down. A visit to the Colosseum can take anywhere from 2 hours to 4 hours depending on how much time you have and how much you want to see. The hours are pretty generous; every day from 8:30 AM until one hour before sunset. Since it's not closed on Mondays when most museums are closed, Monday is a great day to visit. 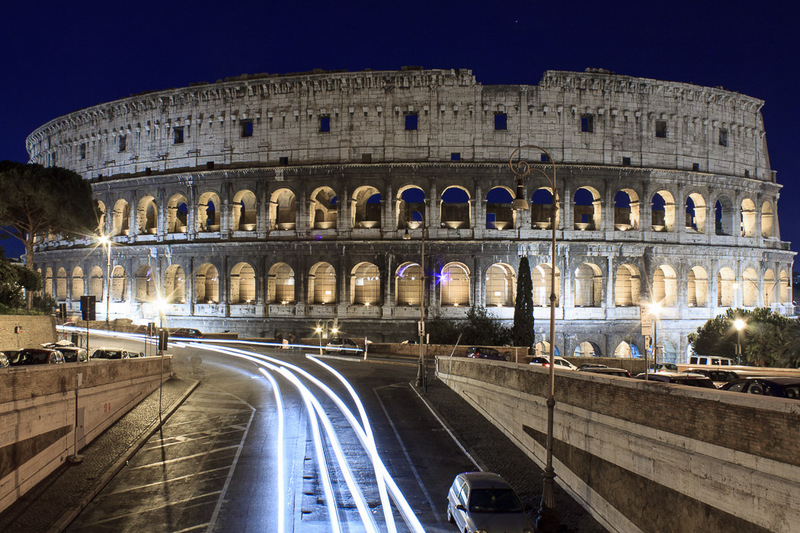 The Colosseum is an elliptical amphitheater, the precursor to today's professional football stadiums. It is the largest amphitheater ever built in the Roman Empire and is considered one of the greatest works of architecture and engineering in ancient Rome. It could hold between 50,000 and 80,000 spectators. It is 615 feet long, 510 feet wide, and its outer wall, only still existing on the northern side, is 157 feet tall. The arena (field) is 272 feet by 157 feet. It was used for gladiator fights, animal hunts, simulated sea battles, classical mythological dramas, and executions of criminals and prisoners of war by crucifixion or by the mouths of hungry lions. Contrary to popular belief, there is no evidence that it was used as a place of execution for Christians. Construction was started by Vespasian in 70 AD and completed by his son, Titus, in 80 AD, funded with booty seized during the Roman victory in the first Jewish-Roman war in 70 AD, which included the treasures taken from the temple as depicted on the Arch of Titus. The building is made up of simple structures such as arches, barrel vaults, and groin-vaults. It contained fountains and toilets which were connected to the Claudian aqueduct. The inaugural games, sponsored by Titus lasted over 100 days. Modifications were made by Vespasian's younger son, Domitian, from 81-96 AD. 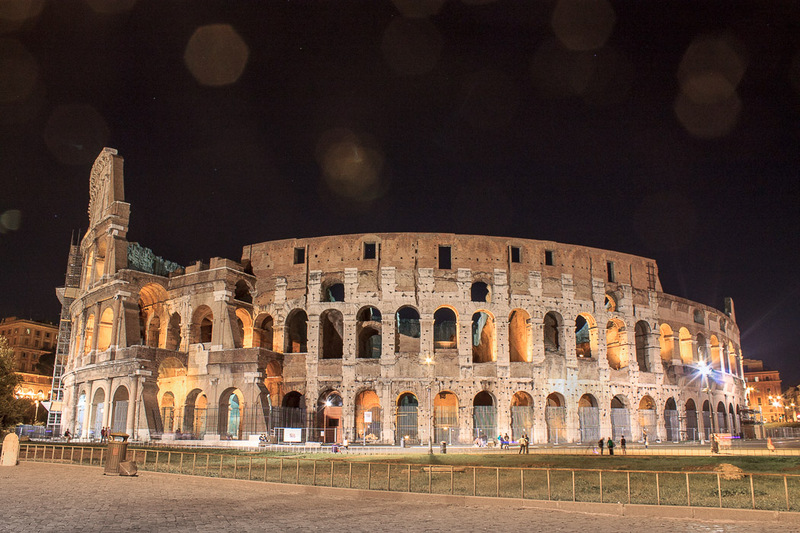 These three emperors formed the Flavian Dynasty, and the proper name of the Colosseum is the Flavian Amphitheater. It later became known as the Colosseum because of the colossal statue of Nero which stood outside, a relic from when the land was used for a lake in front of Nero's opulent palace called the Domus Aurae. The Colosseum served political purposes beside just providing entertainment for the people (recall that bread and circuses are all the people need, and the Colosseum supplied the circuses half of that formula). Its construction on the site of the lake of Nero's Domus Aurae let the people take control of the land that had been stolen away by Nero. It demonstrated that the Empire had returned to political stability after Nero's unsuccessful reign and the subsequent civil wars. It was a constant reminder to the citizens of Rome that the Senators and the Emperor had supreme authority through the organization of the games and through the class-based seating assignments. And it linked the Flavian Dynasty (Vespasian, Titus and Domitian) to Augustus by using the main architectural motifs of the exterior of the Theatre of Marcellus. 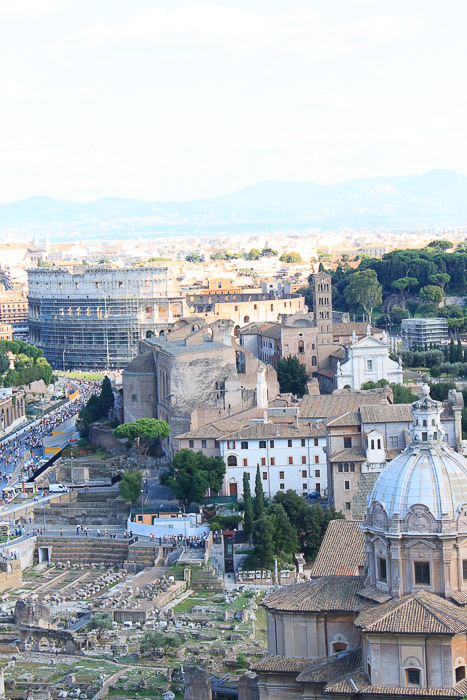 (In fact, during my first trip to Rome, this newby Tourist in Rome was quite confused when I looked west from the Victor Emmanuel Monument and saw what looked like the Colosseum in the "wrong place". 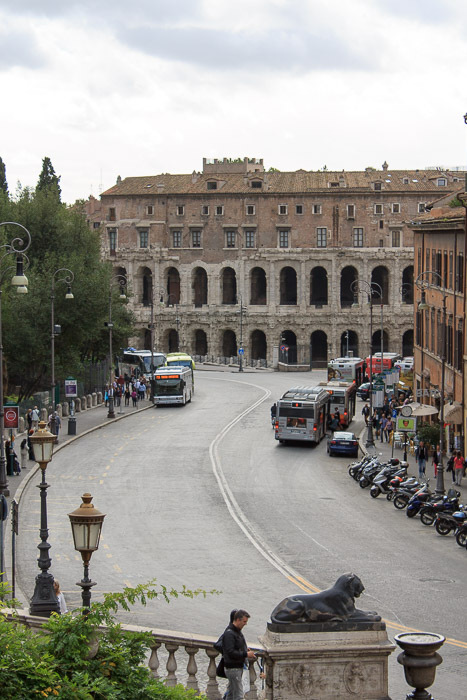 After returning home I figured out what that the building in that photo was -- the Theatre of Marcellus.) It also conveyed the power of the Roman Empire through its sheer size, dominating the Roman skyline. The exotic beasts exhibited in the Colosseum were a visible reminder that the Roman Empire was expansive, stretching to all parts of the world, and that the Romans were in control of nature. The gladiator matches reinforced the military values espoused by Roman Emperors; courage in battle and triumph over death. 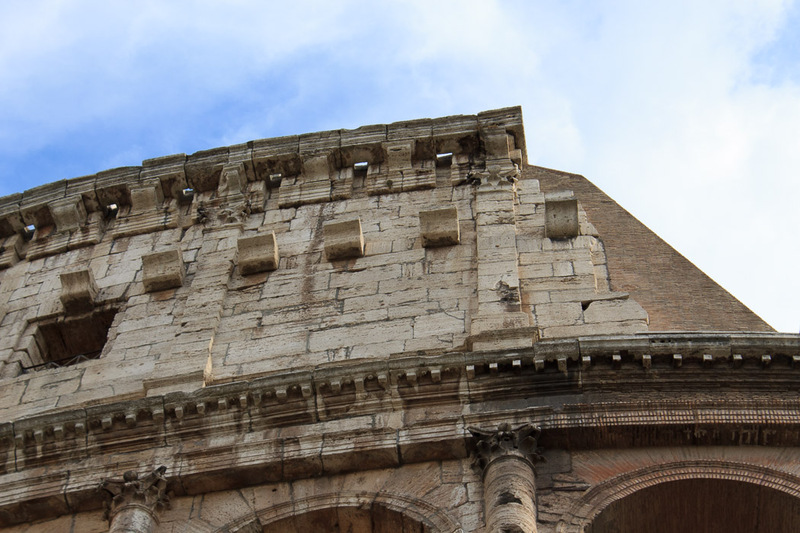 The Colosseum was ringed by 80 entrances at ground level, each numbered with a roman numeral at the top of the arch (1st photo below), some of which are still visible today. 76 of those entrances were used by spectators. A spectator's pottery ticket into the Colosseum would have his gate number, section number and row number on it. After entry into the proper gate, he went to his seat vis passageways that opened onto a tier of seats from below or behind. Those passageways were called vomitorium, which derived from the Latin word for rapid discharge, from which the English word vomit derives. The vomitorium were the way that the 50,000 to 80,000 people inside the Colosseum were able to exit the stadium quickly without trampling each other; there was enough 'bandwidth' to let everyone exit in an orderly fashion, just like all the exits at a modern stadium. 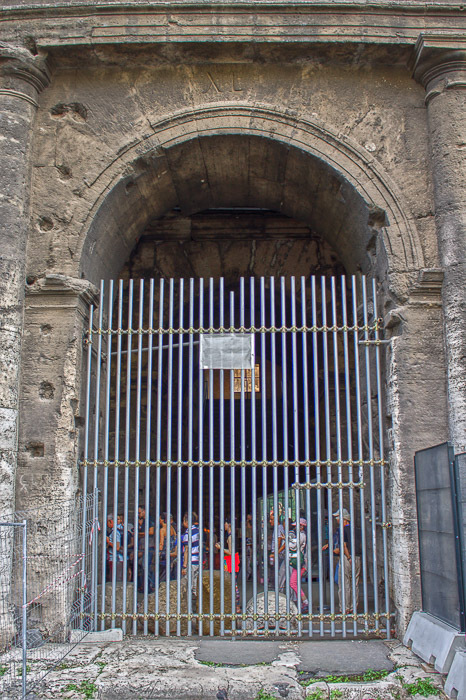 The other four entrances into the Colosseum were one for the Emperor, two for the entering gladiators, and one for the removal of corpses from the arena. There were various levels of seating inside the Colosseum (2nd photo below). Special boxes were provided at the north end for the Emperors and at the south end for the Vestal Virgins. At the same level was a broad platform or podium for members of the religious orders and for senators. The names of some 5th century senators are carved into the stonework, reserving their spot. (There was no subsequent Senate to replace their names since the Empire fell shortly thereafter.) The tier above the senators was available to the noble class. The next level up was for ordinary Roman citizens (plebeians), wealthy at the bottom, poor higher up. Another level, added by Domitian at the very top was for the common poor, slaves and women. The interior of the Colosseum, showing levels of seating. The benches are now missing, but they once were on the sloping rings. The arena had a wooden floor covered with sand. This stood on top of its underground structure called the hypogeum (three photos below). The hypogeum is an underground network of tunnels and cages where gladiators, animals and props were held until their turn in the arena arrived. 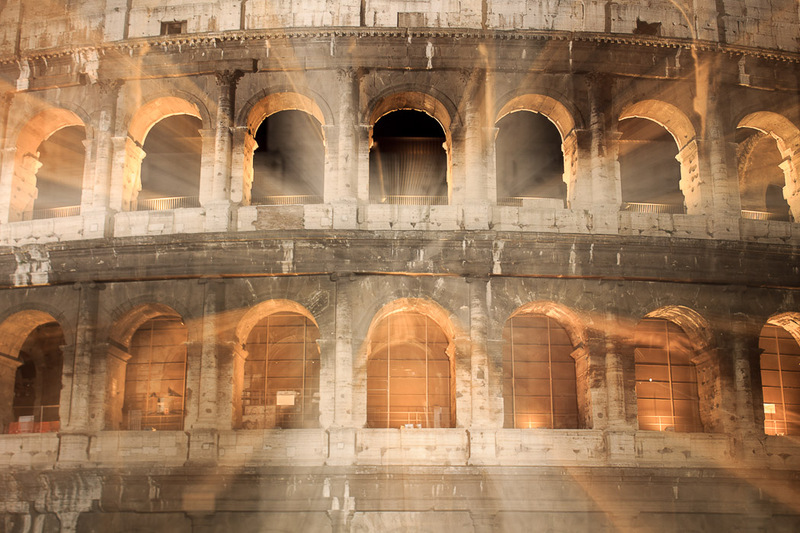 The hypogeum and the third floor of the Colosseum are closed to the public, but can be visited by hiring a tourguide. 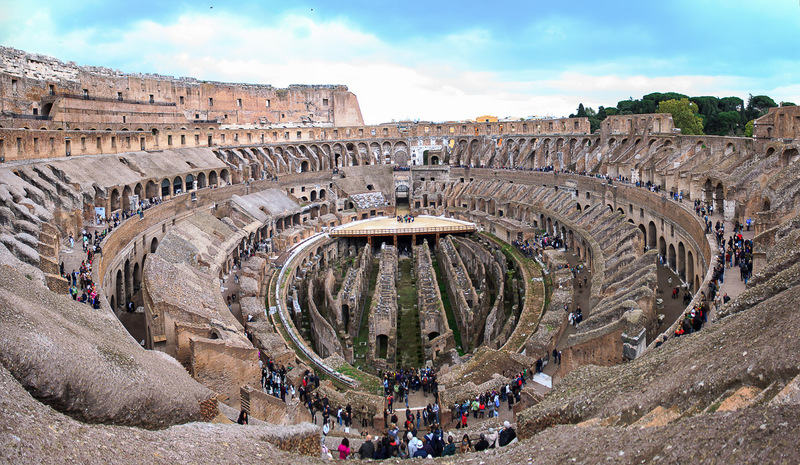 Search google for "hypogeum tour colosseum" and you should be able to find several options to reserve a tour. There were 80 vertical shafts in the hypogeum which provided instant access to the arena floor through trap doors. Elevators and pulleys raised and lowered animals and props through these tunnels. There is also evidence for hydraulic mechanisms. 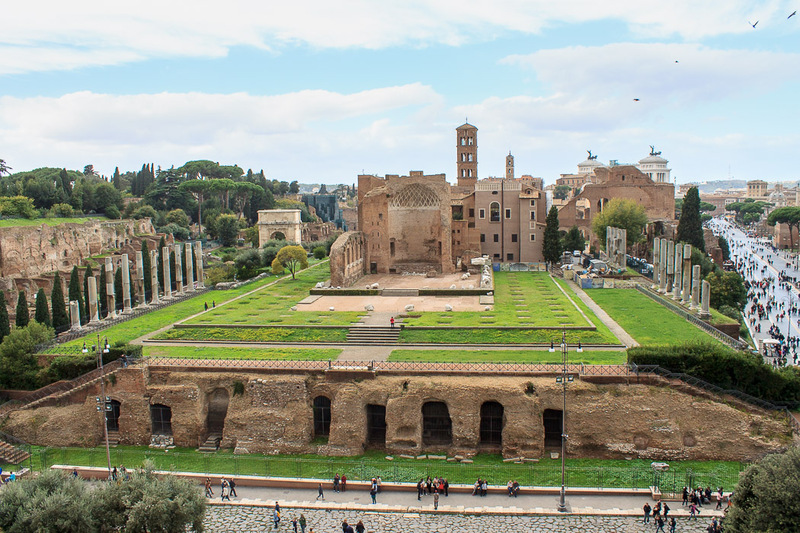 The hypogeum was connected by underground tunnels to nearby stables where animals were kept, and with the gladiators' barracks and training school called the Ludus Magnus which can still be seen today just east of the Colosseum across the street. Tunnels were also used to let the Emperor and the Vestal Virgins enter and exit the Colosseum without them needing to pass through the crowds. 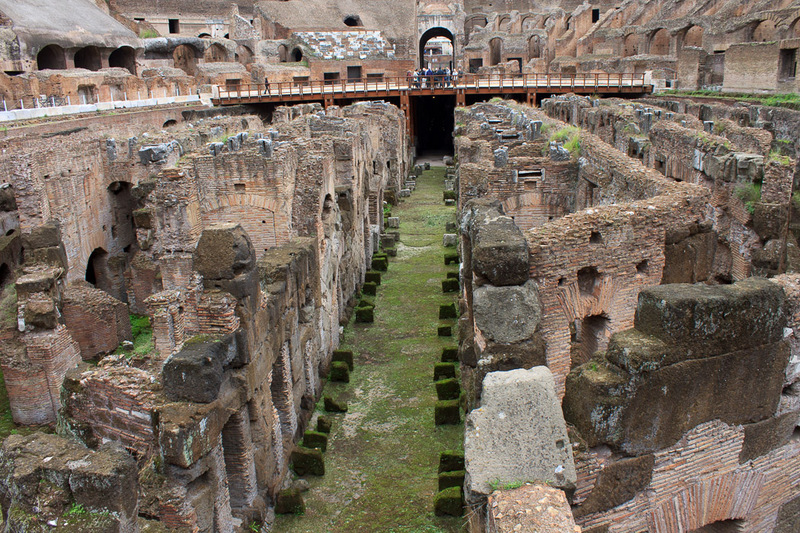 A connection to an aqueduct allowed the arena to be flooded rapidly, allowing re-creation of naval sea battles during the early years of the Colosseum. Large chambers under the level platform built for the Temple of Venus and Rome were used to store machinery and apparatus used in the Colosseum's games (bottom of 4th photo below). 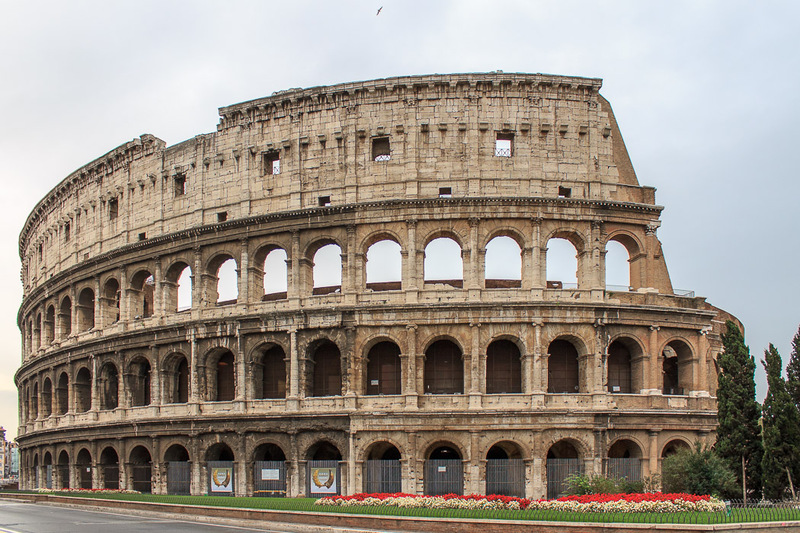 Because of the intense summer heat in Rome there was a ring-shaped canvas awning called the velarium over the grandstands of the Colosseum to protect spectators from direct sunlight. Even though I've always travelled to Rome during September and October, there are several days I could have used a velarium myself. 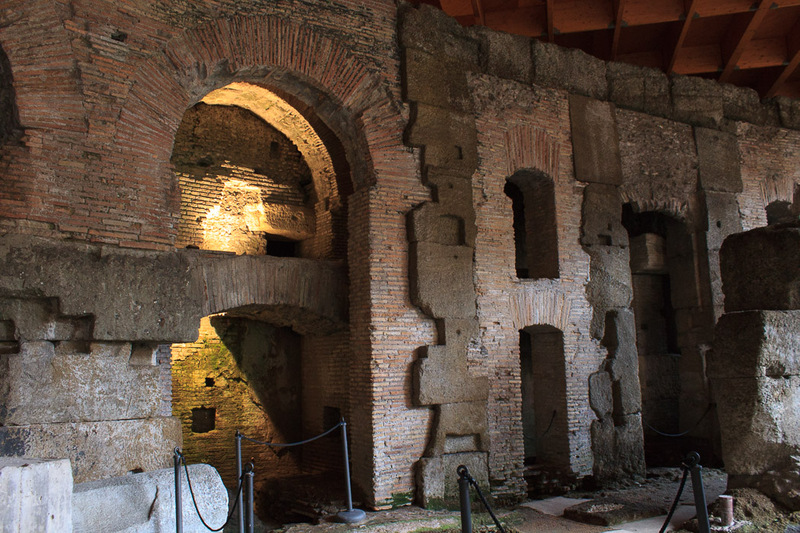 All around the top of the Colosseum were sockets for 240 wooden beams which supported the velarium (1st photo below). The beams rested vertically on the supports which jutted out from the wall, and went through the holes above the supports which held the beams in place (4th photo below). Ropes from the canopy went through pulleys on top of the beams and down to the ground where they were attached to small pillars anchored in the ground 59 feet from the outer wall of the Colosseum. 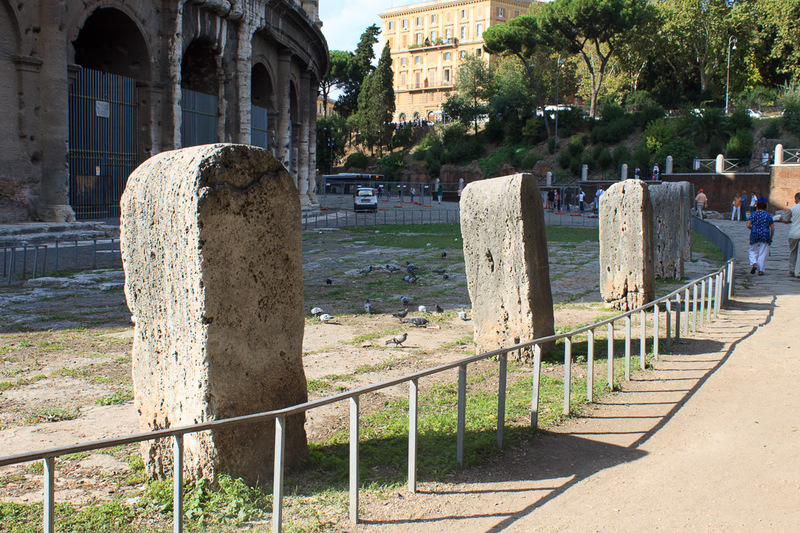 Five of these pillars remain on the east side of the Colosseum today (2nd and 3rd photos below). The ropes were controlled by skilled sailors of the Roman fleet who repositioned the velarium to most effectively shade the crowd. The Colosseum was made from several concentric layers attached to each other. 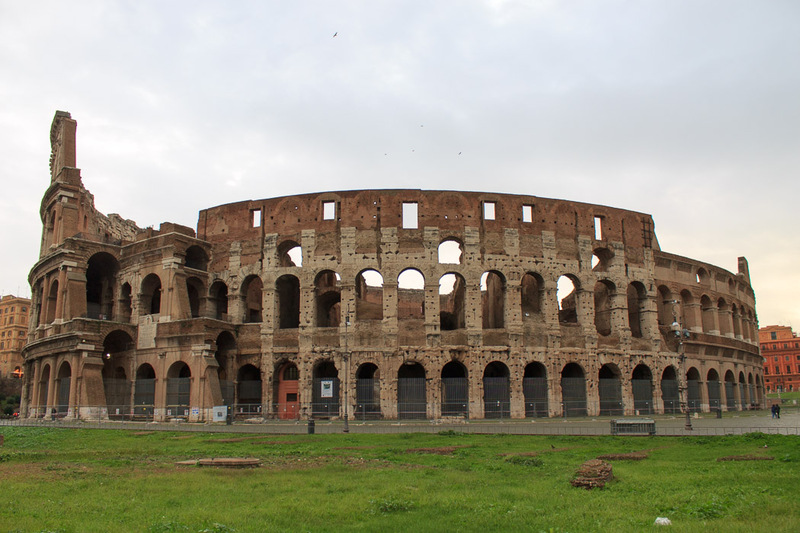 The first two photos below show the south side of the Colosseum, where three of the layers have been stripped away by earthquakes in 847, 1349 and 1826. So far the north side of the Colosseum (photos at top of page) has not been affected by such devastation. Other destruction has been caused, as with most other ancient buildings in Rome, from illegal theft or legal repurposing of the marble veneer, stones, and metal of the buildings. During the Middle Ages, the Colosseum was known as the Temple of the Sun and was thought to be the home of demons. During the 12th century it became a fortress of the Fragipane family. Then it was used as a stone and marble "quarry" for many other buildings, including St. Peter's Basilica and the Palazzo Farnese. The holes in the outer walls and columns that look like woodpecker marks, especially on that southern side, are from the iron pins that attached the layers to each other. The iron was valuable and was stolen, too. In fact, large sections of the Colosseum as it now stands are not ancient at all, but the result of restoration during the 19th century. 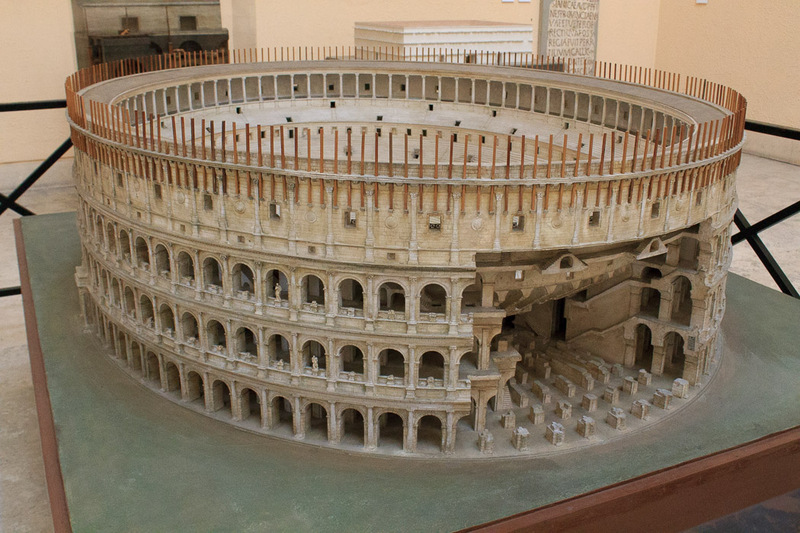 The model of the Colosseum in the Museum of Roman Civilization (4th photo above) shows the Colosseum in its prime. Notice the 240 beams for the velarium, three for each of the 80 entrance gates into the Colosseum, resting on their supports and going through the holes above. The ground floor columns were in the Tuscan style (a Roman variation of the Doric order). The second floor columns are Ionic, and the third floor columns are Corinthian. The fourth floor has flat Corinthian columns with a rectangular window every second panel. The panels without the windows each had a bronze shield. There were once statues in the second and third floor arches. The Tuscan and Ionic columns probably show best in the top-left photo on this page. The Corinthinan columns probably show best on the 1st photo above. 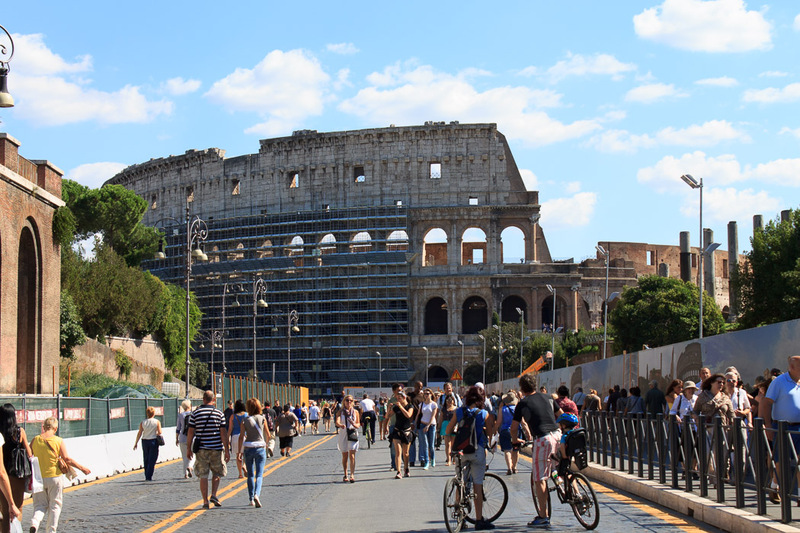 Beware, the Colosseum is now (as of fall of 2013) undergoing renovation. The right half of the northern side is covered by scaffolding. I tried so hard to avoid having the scaffolding in any of my 2013 photographs that I just realized I have only the two photo below to illustrate it. I imagine that after this section of the Colosseum is cleaned and restored, the scaffolding will move toward the left. The restoration is to be done 150 feet at a time. It is expected to take 3 years. This makes at least 7 things that are undergoing renovation in fall of 2013, the other six being the Arch of Constantine, the Pyramid of Cestius, the Fountain of Ponte Sisto, the Triton Fountain, the Bernini Fountain and the Fountain at Villa Medici.